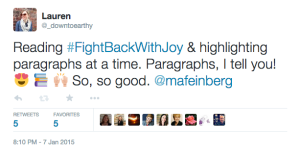 I first heard about Fight Back With Joy through social media. I’d been thinking about choosing joy as my focus word for the year, and when I saw posts about how much people were looking forward to this book, I researched it a little more and preordered it right away. The preorder was for my Kindle, but I purchased a paperback to give as a gift before I’d even finished reading! It’s just that good. 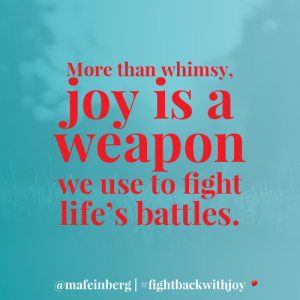 Margaret Feinberg has written several books and Bible studies, but she describes Fight Back With Joy as her most vulnerable because it’s about her battle with cancer, a battle she chose to fight with joy. She describes God as “an unconventional teacher,” One who often “hauls clarity into our lives through the most confusing circumstances.” While her examples come from her personal experiences, she prompts you to think about the confusing circumstances in your own life, reflecting on scripture in a way that reframes your approach to adversity and disappointment. 1. You can’t always choose your fight, but you can choose your weapons. If I’m being honest, I realize that I choose cynicism far too often. That is not my only option. That is not my destiny. While I may be frustrated—especially with fights that pick me instead of the other way around—I do not have to make my frustration worse by choosing negativity. 2. Happiness and joy may look different depending on the situation, but they exist. We have to seek them and choose them. I’m working on this right now. We’re often tricked into thinking that happiness looks like a certain job or house or outfit, but we know that isn’t true. Happiness and joy are much deeper than that. 3. God is always bigger than whatever I’m facing. So many parts of this book resonated with me. 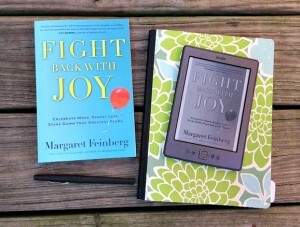 Feinberg gives real advice, reminding us that “sometimes we need to give space for grief in order to make room for joy.” At the end of the book, there are tons of great resources to help you choose joy, no matter the circumstance. I love reading and finding new books that interest me, but it’s rare that I find an author and want to read every single thing he / she has ever written. About halfway through Fight Back With Joy, I knew this was an author whose books I would read and reread for years to come. Several of Feinberg’s other books were available for Kindle at discounted prices, so I purchased The Sacred Echo, Wonderstruck, and Scouting the Divine right away. I’m sure I’ll be writing about those soon, and I hope you’ll share some recommendations with me, too! Let’s fight back with joy, shall we? It’s so much better than the alternative. I’m halfway through this book, as well. Love it. It’s helping me everyday. 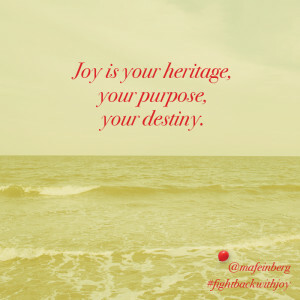 Hope, I am so thrilled you are enjoying Fight Back With Joy! Hope, isn’t it great? : ) I love how it has something to offer every reader, no matter where we are in our journeys. Lauren, I am overjoyed that you enjoyed Fight Back With Joy! Grateful for you. Thanks so much, Margaret! You and your books are such blessings to me.